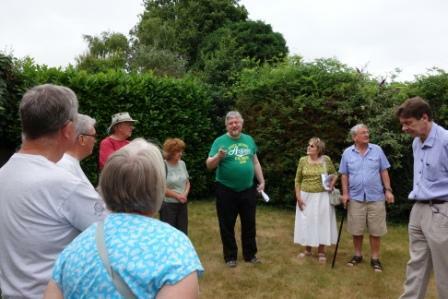 On 20 July 2013 Roger Mayo gave a guided walk to BAHRG members and others. The route was similar to the walk in May 2013, looking at signs of the former Blendon Hall and its estate. 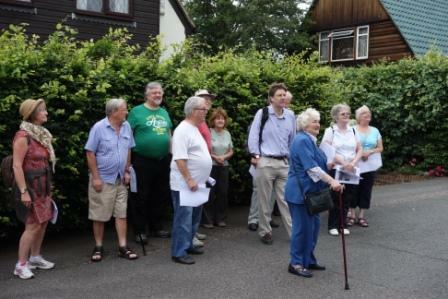 Walking down The Drive (a 1930s road, not the original drive to the Hall!) we saw the West Lodge, still standing but most recently used as offices and now up for sale. Further along we imagined seeing our first glimpse of Blendon Hall itself, across the lake which was once here. Turning into The Avenue we imagined seeing lakes on either side of the bridge which was here; the lakes were finally drained in the 1980s. At Beechway and The Sanctuary we saw the location of the Georgian Hall and heard about the discoveries which have been made from historical and archaeological evidence, including the underground tunnel. We visited a property in The Sanctuary (with a cup of tea and biscuits, thanks to Geoff). We then visited an additional private garden in Beechway which lies at what was once the front entrance to Blendon Hall and where the very first BAHRG archaeological excavation took place. 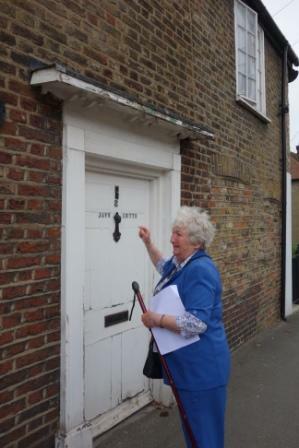 A BAHRG member also told the group about her time living in Jay’s Cottages.